An experiment with frozen yogurt that’s halfway to ice cream. Among my many “wrong” opinions (such as the fact that I hate avocados) is that I don’t really love ice cream. I’ve enjoyed it, and occasionally I even crave it, but unlike most people, I really could do without it most of the time. I think part of the problem is that I don’t find most ice cream refreshing, so it seems pointless to eat it in the intense heat of summer, when I’ll just want a glass of water afterwards anyway. But still, I like it enough that I really like making it, and so I keep fiddling with recipes for the few kinds of ice cream I really enjoy. A few years ago I tried my hand at making Pinkberry style frozen yogurt (I’m a fan of their pomegranate flavor, I get it topped with mango, mochi, and chocolate crispies) and it was good, but a bit disappointing. The problem with making frozen yogurt at home is that, unless you are a real frozen desert fanatic, home ice cream makers are limited to the spinning frozen core design. This is a great machine – it automatically spins a frozen bucket against a paddle, forcing the paddle to move whatever you put inside the machine against the frozen walls. This means that the liquid you put in there freezes on contact with the wall of the machine and then gets scraped off, incorporating the newly frozen bits with the rest until the whole thing is uniformly frozen. The problem with these machines is that because the core of the machine itself is frozen, it freezes whole blocks of the liquid at once, and the longer it goes, the worse it is at freezing. If you want to end up with something that doesn’t feel like shards of ice, you need an ice cream base that will produce small ice crystals that can be evenly distributed for a smooth final texture. This means that the closer your base mix is to water, the worse it will be in the end. As a result, the most basic frozen yogurt recipe (yogurt mixed with fruit juice) is oddly icy – not quite grainy, but not satisfyingly smooth either, and not as pleasing as a granita (which doesn’t require any specialized machinery but does take a lot more care and attention). Home ice cream mixes, then, should be as close to custard as they can be, and certainly as cold as they can be when they go into the machine. I learned this when I started making ice cream with my brother D a few years ago. 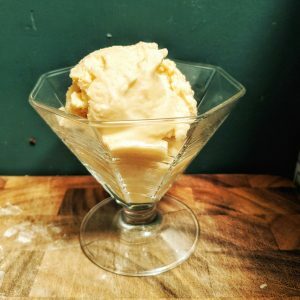 Commercial kitchens that have nice big refrigerated churners need a thinner mixture, so recipes written by chefs often tell you only to cook a custard ice cream base (anything that’s a combination of eggs and liquid dairy) until it’s barely thickened. But this never got a really nice texture. You need a fairly thick custardy mixture for a home machine, since these machines are just freezing and not really churning that much (you always see on Chopped some unfortunate contestant who left their ice cream going too long and ended up with butter – this doesn’t really happen in a home machine). The thickness comes from how much you let the eggs cook, but also how much sugar you have in the mixture to punch into the ice and break it up. Similar to when you make cookies and you cream butter and sugar together, the sugar actually abrades the butter and helps it become soft, smooth, and fluffy. Having a good amount of sugar in the ice cream mixture creates space between the ice that smooths out the final texture. The temperature of the mixture is also really important, because that little core in the home ice cream maker has a limited amount of cold in it (for a totally un-scientific explanation of what’s going on) and you don’t want to waste it cooling down the mixture. The last factor that I realized was really important is that the machine be running before you add the liquid in – even though this is literally in the instructions of every recipe, I kept ignoring it. This is crucial because that first bit of liquid that touches the sides of the machine will stick to the core and never come off, hogging prime real estate and sabotaging the nice small-crystal making for the rest of the batch. To that same point, the core itself should be as cold as possible – mine just lives in the freezer (make sure you can position it sitting flat, since there is liquid in it and it won’t work as well if the liquid isn’t evenly distributed or if there is more on the top of the core than the bottom). With these features in mind, I worked together my ideal of a refreshing peach frozen yogurt that’s a little more like ice cream but still unobjectionable health-wise. I made a custard base with milk and eggs and combined that with yogurt (regular smooth yogurt, not Greek) and peach puree. I actually made a mistake in adding the yogurt to the milk and eggs while they were cooking, and even though the yogurt separated a little, the final product was very smooth so it didn’t seem to matter. I cook with runnier yogurt because I find that most recipes need the extra liquid and Greek yogurt makes something that’s too dry. I also use whole fat milk and yogurt because without some fat there’s just too much water in the mixture. Finally, I added vanilla and cinnamon to the peaches to boost their flavor – I find that this combination really accentuates the flavor of the peach, and especially that cooking the vanilla extract directly with the peaches returns its flavor to more what it would taste like if I had used a vanilla bean than if I cooked it in the custard, probably because the direct heat allows it to cook off the alcohol. I ended up making an enormous batch, about twice as much as I needed (overloading my machine in the process, although it still performed admirably), and I’m continuing to tweak the recipe. As I made it, this is a nice palate-cleanser – refreshing in that it doesn’t coat your tongue with dairy and fat, and not overwhelmingly peachy (though it is quite yogurty). But the recipe I’m providing here has half the amount of dairy to boost the peach flavor, and is scaled down to a more reasonable batch. In a small saucepan over medium heat, combine 8 oz (by weight) frozen peaches, a pinch* of cinnamon**, 1/8 tsp vanilla extract, 2 tbsp brown sugar, and a pinch of salt. The mixture will be chunky at first, but as the sugar hydrates and the peaches defrost it will develop a good bit of liquid at the bottom. Cook until the peaches are very soft and the liquid is caramely. Remove from the heat and transfer to a blender – once it has cooled a bit, puree (slowly). Return the saucepan to the stove and add 3/4 cup milk, 2 tbsp white sugar, a pinch of salt, and 1 egg. Whisk thoroughly to combine (a smaller whisk is easier to manage here) and continue stirring with the whisk, making sure to scrape across the whole bottom of the pot and into the corners, for about 10-15 minutes until the mixture thickens. Remove from the heat and add 3/4 cup plain whole yogurt, again whisking to thoroughly combine. Add the peach puree as well and combine a final time. Chill the mixture at least 4 hours, though overnight is best – I like to store it in a container with a tight-fitting lid that I can use for the finished frozen yogurt, like a glass tupperware or an empty yogurt container. When the mixture is really cold, add it to a running ice cream machine and churn 20 minutes. At 20 minutes, check – the mixture should be fluffier, very thick, and take up more space. Taste it to see whether it has enough ice in it – if it feels grainy, let it continue running. Run for up to half an hour (at this point a lot of the liquid in the core will have melted and it wont’ be doing anything anymore). Remove the mixture from the machine, transfer to the storage container of your choice, and allow to set for another hour or so (although you can certainly start to eat it right away, it will just be melty). *When I say a pinch in this recipe, I mean it in the technical sense – about 1/16 tsp – not in the way chefs mean it, which is typically however much you can manage to hold between all of your fingers at once. **Real cinnamon – sweet smelling and brown in color – is better here than cassia – spicy and red. Look for Ceylon cinnamon or something similar.